Appreciative Inquiry (AI), a positive and collaborate approach to organizational change, is taking hold in clinics, classrooms, and executive offices of leading healthcare organizations worldwide. 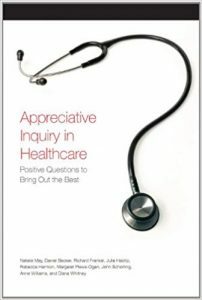 Appreciative Inquiry in Healthcare: Positive Questions to Bring Out the Best is a practical toolkit designed to stimulate positive change and engage others in creating the healthcare environment so desperately needed today. It is an encyclopedia of positive questions to help you and your team: Harness the creative energy and passion of people at all levels; Focus positive energy on the challenges facing your healthcare organization; Create a culture of top quality care; Learn about and support the best of caregivers, patients, and families; Embrace improvement opportunities with commitment and optimism; and Build collaboration based on trust and a belief in the best of one another. AI thought leader, Diana Whitney and the team of healthcare professionals at the University of Virginia Health System have joined together to provide this book of questions and AI activities designed especially for hospitals, clinics, medical educators, and health care leaders.